There are certain businesses whose appearance is considered an omen of good fortune for an upcoming neighbourhood -- call it the "Starbucks factor." In addition to the loved-and-loathed coffee franchise, there are other retail trademarks that make realtors happy: a Pusateri's is always an ominous sign of rising home prices, as is a Chapters/Indigo, and any kind of Mac-centric computer shop, though an actual Apple Store is almost more than mere mortals can hope for; it's like the mothership has touched down on your local main street. On a humbler level, the arrival of a Friendly Thai is always welcome. While hardly considered the top of the Thai dining pyramid, its clean signage and modernist dĂŠcor speaks to the aspirant, and neighbourhoods like the Junction, Roncesvalles and Leslieville are all currently graced with a franchise. But, as anyone who's homebound with a hankering for Friendly Thai will discover, the links between locations are intangible, and phoning the Yonge Street store when you want Pad Thai in the Junction will get you a polite apology and a request to try another number. "I honestly don't understand it myself -- it seems very strange," says the nice young woman on the phone at the Yonge street Friendly Thai when I ask to talk to the manager. She says they get calls from people making this mistake all the time, and can't say for sure if there's any connection between the sundry Friendly Thais around the city. There have been, at different times in the last six years, up to seven or eight Friendly Thais in operation. The four currently answering their phones are being joined by a fifth on Queen West (shown above) -- a location that's moved progressively further west every few years, starting at Portland before briefly taking over a vacated Amato's a block away two years ago, and now resurfacing near Euclid, with a storefront that doesn't quite match the look of the other locations. 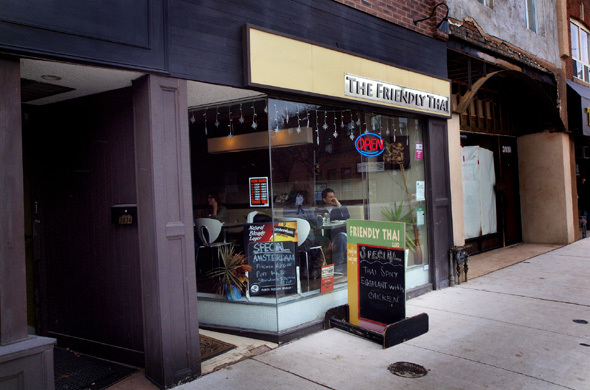 A Friendly Thai on Eglinton West ended up owning the friendlythai.ca website, which advertises something called Thai Grill, and two phone numbers that no one answers. Thai restaurants have a history of restlessness in this city, it seems -- Wandee Young's Young Thailand has left a trail of its peregrinations all over Google, and currently rests at just three active locations at the moment, since its St. Clair West eatery became a casualty of that street's retail-blighting streetcar overhaul. There are also two Sukhothais in the GTA -- one on Parliament and one in Mississauga, with separate websites and nothing, apparently, in common. 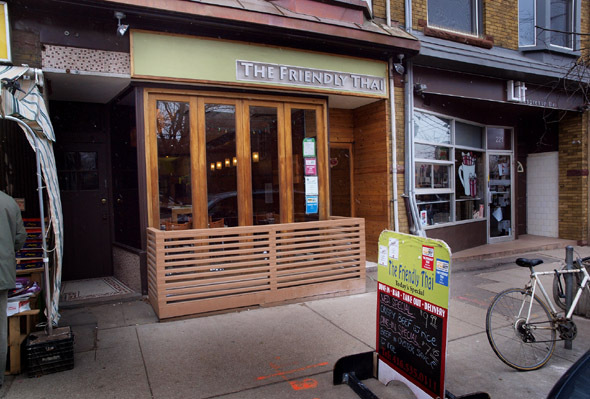 The owner of the Roncesvalles Friendly Thai (above), Arul Subarmaniam, tells me that his store has nothing to do with the other locations, which seems to be true -- its website (myfriendlythai.com) has no links to the stores on Dundas West, Yonge or Queen East. The owner of the Yonge Street store doesn't return my many messages, and in any case his store does business online as thefriendlythai.com. It's a mystery that makes me think of all the pizzerias in New York City doing business as Ray's -- "Famous" or "Original" or some variation thereof, with at least 46 trading under the name as of this year. The owner of the Junction restaurant (above) also doesn't return my calls, but I'm told by a young man at the Leslieville location that his uncle owns the name. He gives me the phone number of a man named Chan Sena, who appears on Google only once, in connection with the defunct Eglinton location. He's curt with me, and admits to owning the name of at least four of the Friendly Thais, and adds that he had the owner of the Eglinton store change it because "he wasn't following my instructions." Before I can get him to clarify his connection to the Queen West eateries, he says that "I can't talk to you about these personal things over the phone -- it's a family business matter," and hangs up, the mystery no clearer than it was when the day started.